Custom Home Builder Wayne Homes announces the release of their newest two-story floor plan, the Auburn. 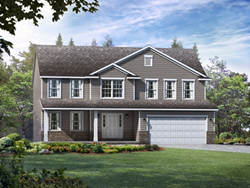 Wayne Homes, an Ohio-based custom home builder that specializes in custom on-your-lot homes, is announcing the release of their newest two-story floor plan, the Auburn. At over 2,000 square feet, the Auburn has 3 bedrooms, 2 ½ baths and is offered in four beautifully designed exterior styles. This home truly has an open concept, enhanced by the two story foyer and great room. The flex space off the foyer provides endless possibilities and access into the great room. In the kitchen you will find a walk-in corner pantry and two casual dining options; an angled bar facing the great room and another bar overlooking the dining room. The impressive master suite has a spacious bedroom, his and her closets and private master bath. A common loft area over-looks both the foyer and great room while also leading to the secondary bedrooms and main bath. Wayne Homes encourages their customers to use the interactive floor plan tool on their website to see several different custom design options that are available. For more information about building a custom home with Wayne Homes and the Auburn floor plan, visit WayneHomes.com. Wayne Homes is a custom home builder in Ohio, Pennsylvania, Indiana, Michigan, and West Virginia (see all Model Home Centers). We offer more than 40 fully customizable floor plans and a team dedicated to providing the best experience in the home building industry. For more information, Ask Julie by Live Chat or call us at (866) 253-6807.